The entire record set linked directly from your plans. Before PlanGrid, APMs were flooded with pushing lots of paper on every project. With the efficiency of PlanGrid they have reduced time spent on administrative tasks by up to 50 percent. -Jeff Cameron, Project Executive, J. Calnan & Associates, Inc.
PlanGrid supports images, spreadsheets, documents, videos, CAD files and even Google Earth. Uploading files is as easy as dragging and dropping them from your desktop or cloud. Similar to sheets, documents can be easily marked up, shared and edited with text, pen and highlight tools. Whether it’s specs, submittals, RFI responses, schedules or installation instructions — any document can be added as a custom hyperlink to your plans. A new version of a document will save as "V2" and all users will be directed to the newest version by default. Attach as many documents as you like, regardless of your PlanGrid plan. Keep them organized and easy to find in our folder structure and with powerful search. Notify teammates or ask for updates by mentioning their names in comments, and reference sheets and documents that can be jumped-to instantly. One of our reps will be in touch with you right away. Thanks! Someone will contact you soon. Automate your administrative tasks and manual data entry. Place and find docs right in your plans and at your fingertips. Effectively manage submittals through every step of the approval process. Upload your spec book to automatically create a submittal log in minutes. Streamline RFIs for faster turnaround and easy resolution. Make updates and instantly sync the entire project team on every device. 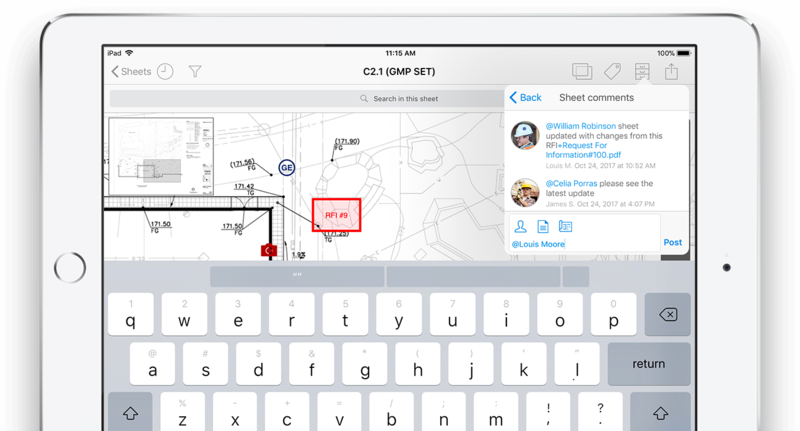 Create and share markups and measurements from anywhere. Track and resolve items in record time with issue stamps. Track work and bring visibility across the construction lifecycle. Overlay different versions of the same sheet (or two unrelated sheets). Capture progress as you work with 360° photos on your project. 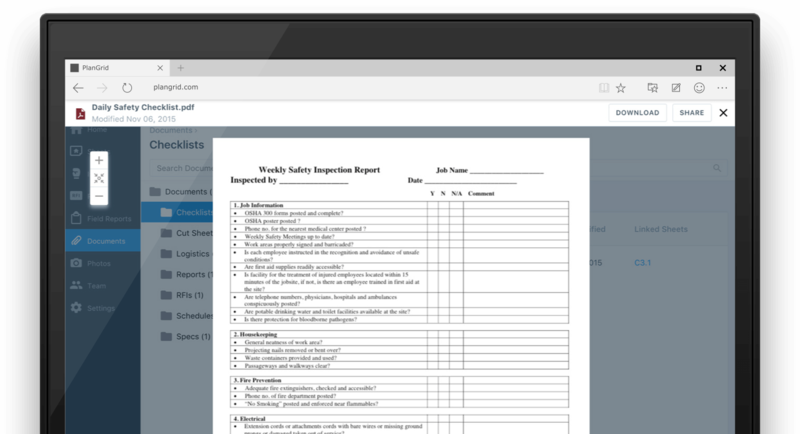 Complete progress reports, site inspection, safety and checklists. Export or email exactly what you’re seeing, and where it is on the plans. Generate accurate and comprehensive as-builts with just one click. Easily manage teams and projects from a single place. Controls at all levels to ensure that your project data is protected. Connect PlanGrid with software you already know and love. Take control of how your team collaborates with separate, private spaces. Document projects and track jobsite progress with HD imagery using EarthCam's high-quality webcam. 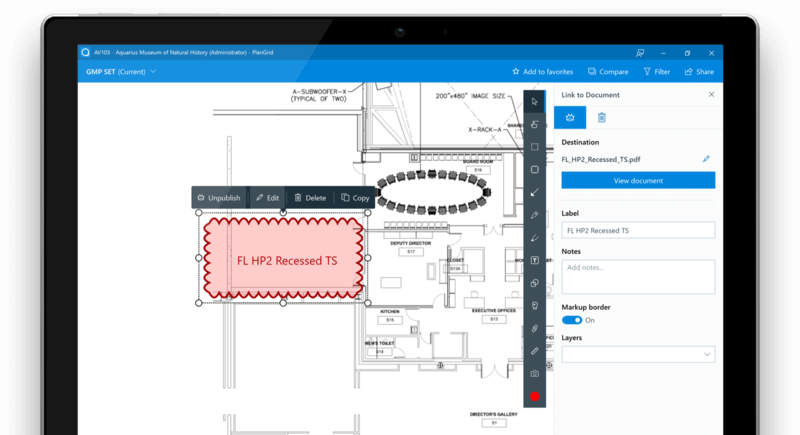 Data captured with SiteAware, including snapshots from 2D, 3D, and 4D models, is directly saved to PlanGrid documents.